The Code of Support Foundation is seeking event volunteers and/or interns to help plan, support, and execute events and other fundraising projects scheduled between now and the end of the year, including but limited to, our annual Toast to Our Troops gala. Ideal volunteers would be available to assists in the office at least once a week to help the fundraising staff plan events and raise money to support the mission. Please email Matthew Lockwood, Director of Development, at matt@codeofsupport.org if interested. 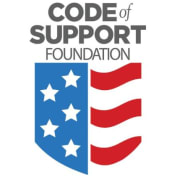 The Code of Support Foundation provides critical one-on-one assistance to struggling service members, veterans and their families who have the most complex needs. We are dedicated to leveraging the nation’s full spectrum of resources to ensure all members of our military, veterans and their families receive the support services they need.